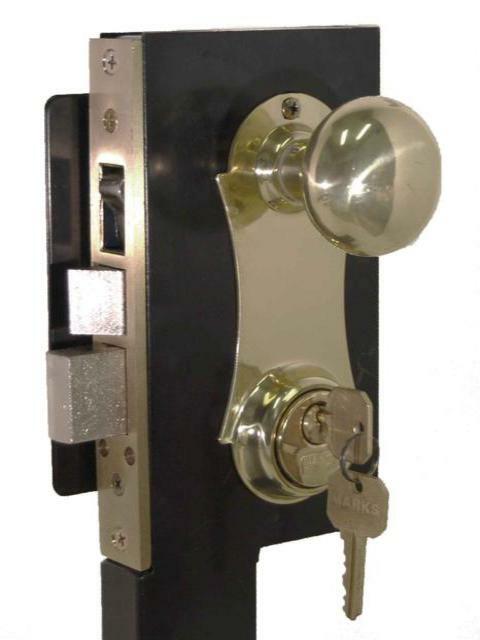 MMK-21AC/3-W polished brass with decorative knob plate lock is a high security mortise lock with a 1" dead bolt and locking latch. It has a day latch feature that allows you to set the rocker switch to auto lock the latch when engaged. If it is not engaged you will have to lock the deadbolt manually to lock your door. You always need to manually lock the deadbolt to achieve maximum protection. Available in polished brass, antique brass, satin chrome and oil rubbed bronze with a standard Arrow/Kwikset keyway. Optional Schlage cylinders are available. Optional Thumbturn inside cylinder option available. Lock is shown as a hinge left shown from the inside view.